Patrick Barney and Susan “Sam” Shockley hold a poster advertising their upcoming show December 2nd starring Amanda King at the Summerlin Library Theater. He’s from Brooklyn. She’s from Chicago, and for the past 30 years they have been “following their bliss”. Bliss currently means a Las Vegas producing venture, “RainMaker Productions LLC”. Patrick Barney and Susan “Sam” Shockley say their newest business has been quite a challenge. 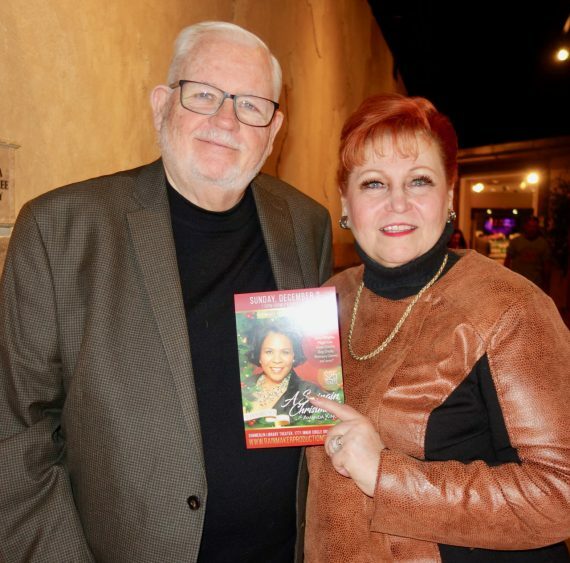 Barney and Shockley met some 40 years ago when Shockley was an event planner with a Scottsdale, Arizona Radisson Hotel, and Barney was Coca-Cola’s man in Scottsdale in charge of community relations. Shockley was in Arizona from Chicago because her mother lived in Sun City, Arizona. Barney, a graduate of Niagara University, had worked as a teacher in Utah and Virginia, attended graduate school in Washington, D.C, and entered the corporate world with posts in Virginia, Denver & Phoenix. Ten years after that first meeting, the two ran into each at church. Barney announced he was divorced, and Shockley said she had been divorced as well. They agreed to have lunch, and those lunches continued. The two also shared an enjoyment of movies …and love blossomed…ending up in marriage. In 1989, a year into the marriage, Shockley was offered a job in Washington D.C. as Best Western’s Worldwide Government Military Sales Manager. The new job took advantage of Shockley’s Scottsdale experience in organizing military reunions and other government gatherings. Barney was fine about re-locating and escaping the corporate world. In the Washington area, Barney taught Business and designed management training programs for various government agencies while at Northern Virginia Community College. He also was the Director of a Small Business Development Center for the SBA in Virginia. 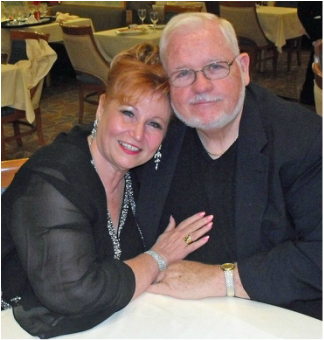 Susan Shockley and Patrick Barney are the proprietors of the new RainMaker Productions. Early in her time with Best Western, Shockley was interviewed on a Fairfax, Va. Public Access TV station. While at the station, she asked the station manager if the station had any movie reviewers. They didn’t, so Shockley and Barney volunteered to produce and deliver a movie review program, “His and Her Movie View”. After their regular work days and on weekends, the couple went to movies, and once a week they talked about those movies on local TV. Their show lasted 20 years. They made more than 600 half-hour TV shows. In the digital era, a travel company could travel with its owners. Such was the case four years ago when the couple decided to return to the West and in fact, move to Las Vegas. They brought 4 More Travel with them and started an on-line TV travel show on the Vegas Video Network. As their TV show subject matter strayed to activities they called “Vegas Beyond the Strip”, the couple was soon interviewing a number of local entertainers. For research, they attended many off-strip shows, noting how many of the local entertainers they saw were talented and needed more opportunities to display that talent. Eighteen months ago, Barney and Shockley decided to leave their TV show, and “following their bliss,” became entertainment producers. Though the couple was familiar with marketing, they had to “learn the ropes” about producing shows in Las Vegas. They knew their goal as producers was to produce great off-strip shows, reward talent by paying them well and possibly make a little money along the way. Searches for venues and available talent began. Were these shows moneymakers? “Let’s just say that we wish more people could have seen these great shows,” answered Barney. RainMaker’s final production of the year, one that the producers admit they can’t help but being excited about, is a holiday show, “A Swingin’ Christmas” featuring Las Vegas newcomer Amanda King. Rainmaker is producing her first show in Las Vegas. (Show time is 7:30 p.m. December 2 at Summerlin Library Theater. Tickets are priced at $25.) “Amanda’s a great talent and we are so pleased to be partnering with her,” said Shockley. Great story. Over the past couple of years I have gotten to know Patrick and Sam and find them to be two of the kindest and knowledgeable people around. We have shared jokes, comments and criticisms, not to mention drinks, and I always come away with knowing that I have two friends.